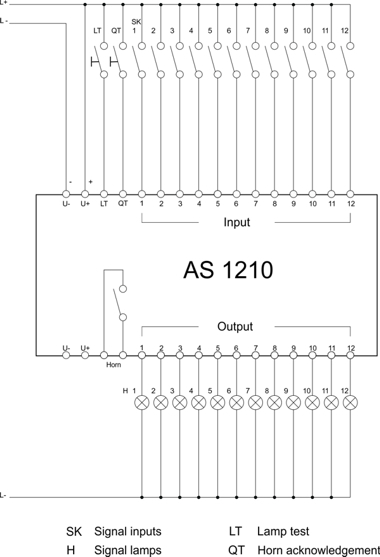 The AS1210 common alarm indicator can easily monitor the function and indicate faults of up to 12 signal inputs. Any faults arising activate the relay. An external signal generator can be connected to the relay. In addition, an optional buzzer is activated on the device. 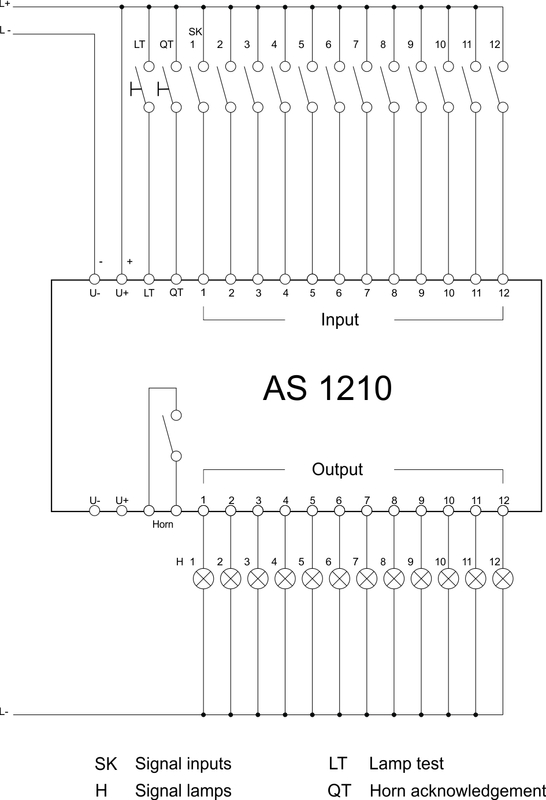 The common alarm indicator AS1210 can monitor up to 12 contacts. 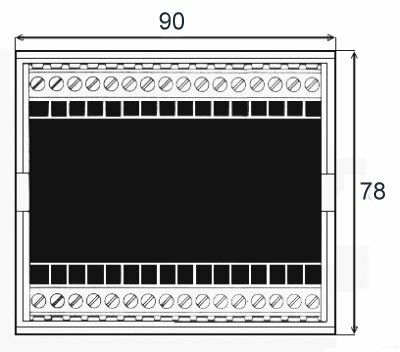 Thanks to its simple technical design, the AS1210 is well suited to upgrade existing control systems and switchboards. 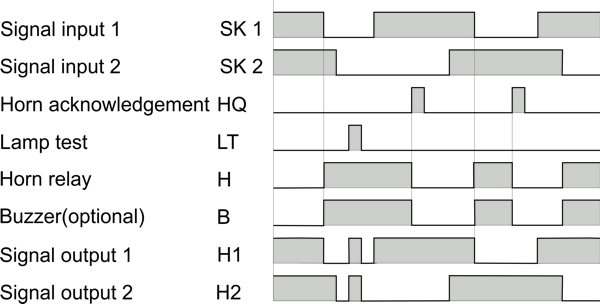 For each signal input there is a correspondent output to signalise inputs with a signal lamp. 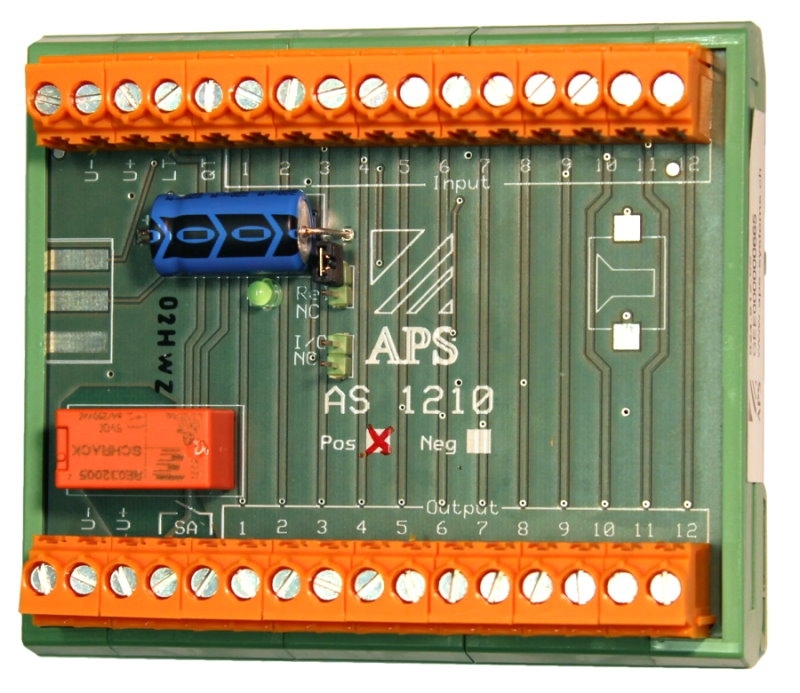 The AS1210 has a relay to connect to e.g. a horn. The relay may be set up as a normally open or closed. An integrated buzzer is optional. With the use of an external button, the alarm can be acknowledged and a lamp test initiated, if required. The signal lamps H are designed as fault indicators. As soon as a signal input appears, the respective signal lamp lights up, the optional buzzer and relay are activated. The connected user, e.g. a horn or a lamp, remains actuated until the QT button is pressed. The same process occurs with each new alarm input, even if other alarms are still pending. Pulse-type alarms are also detected, and the relay is latched until acknowledgement is made. Connecting and activating the LT button initiates all signal outputs. 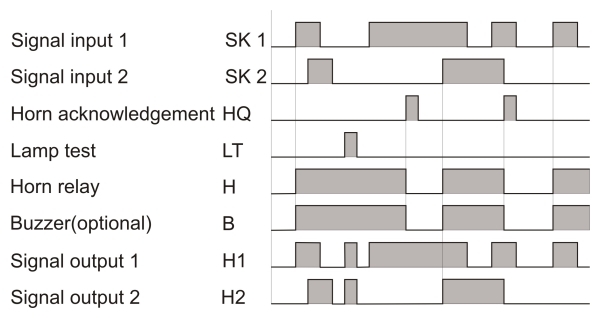 The signal lamps H are designed as operation indicators. As soon as a signal input disappears, the respective signal lamp turns off, the optional buzzer and relay are activated. The connected user, e.g. a horn or a lamp, remains actuated until the QT button is activated. The same process occurs with each new alarm input, even if other alarms are still pending. Pulse-type alarms are also detected, and the relay is latched until acknowledgement is made. Connecting and activating the LT button initiates all signal outputs.